Available only during the holidays, these Wreath Cookies are made with our Chocolate Chip cookie as a base and decorated with fresh Buttercream Icing! Wonderful for get-togethers and sharing during the holidays! Looking for something larger? 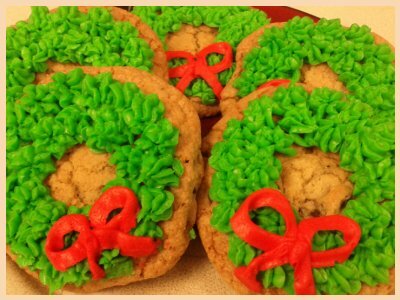 How about a Giant Wreath Cookie?